Ben Hansbrough scored 19 points, added seven assists, and grabbed four rebounds to lead #14 Notre Dame to a 56-51 win at Pitt, which will likely fall from their new perch at #2 in the country. The defeat was the Panthers' first home loss in more than a year, and their first home loss in their past 52 home games. 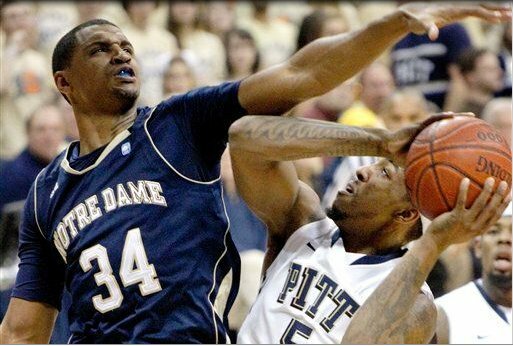 It was also the third consecutive Notre Dame victory in the series, and their fourth in the past five against Pitt. Don't ask me...I certainly can't explain their recent ownership of the Panthers, either. Jamie Dixon's team had a 28-23 halftime lead which they held for more than 10 minutes to start off the second half. The Irish finally took the lead at 42-41 on a Hansbrough three-pointer with 8:29 left and never surrendered it the rest of the way, as Pitt had no definitive answer to stop the senior guard. Hansbrough, a senior and the brother of former North Carolina star Tyler Hansbrough, scored eight of his 19 points in the final 4:29 of the game. Gilbert Brown (13) and Brad Wanamaker (12) were the only Panthers to hit double-figures in scoring, as Notre Dame limited Pitt to their lowest point output of the season. Their previous low of 61 came against American University on December 22. The Panthers (19-2, 7-1) are off for a few days, picking up on Saturday, January 29 against Coach Mike Rice and Rutgers (12-7, 3-4). The Scarlet Knights own conference wins over South Florida, Providence, and Seton Hall this season, and are led by F Jonathan Mitchell at 12.9 PPG. Tipoff is set for 8 p.m.